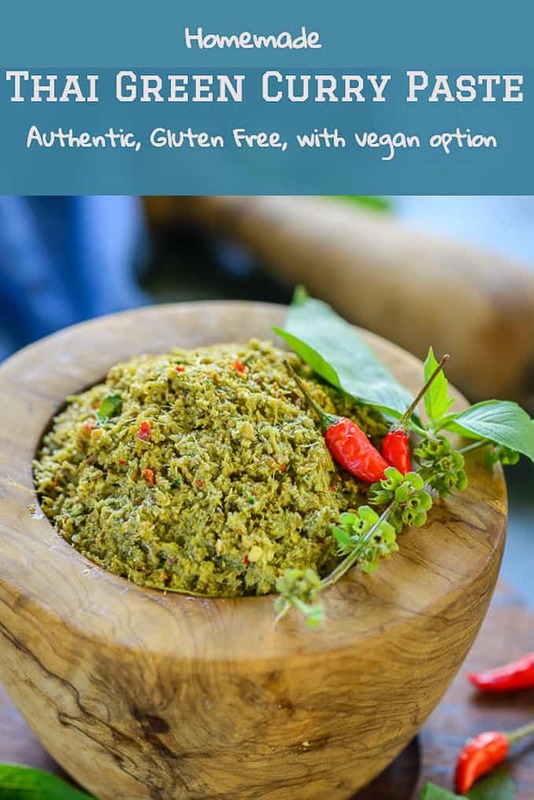 Popular across the thai kitchens of various restaurants around the globe, Thai Green Curry Paste is a tangy, spicy sweet paste native to the region, that is added to a variety of curries and gravy dishes. This recipe makes the best authentic homemade green curry paste from scratch and is super easy to make. Here is how to make Thai Green Curry Paste Recipe. Curry is easy to make when the paste of necessary ingredients is ready at home. Don’t you agree? That is the reason why I keep curry paste like Thai Green Curry Paste Recipe in my refrigerator so that whenever I feel like making a Thai curry, all I got to do is add a Thai curries paste to the foods and my Thai food craving gets sorted. The Best Thai Green Curry paste is the one that you make at home unlike the grocery store bought one. Out of all the Thai curries paste, green paste is the easiest, the tastiest and the most convenient to use! Curry pastes are an important part of Thai cuisine. These pastes comprise of specific ingredients and are spicy sweet to taste. They are added to gravies, dry dishes and even rice. Thai Red Curry Paste, for example, is used to make Thai Red Chicken Curry and Thai Pineapple and Prawn Curry. 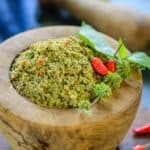 Why to make Green Curry Paste at home? Taste much better than store bought version. It’s very versatile. 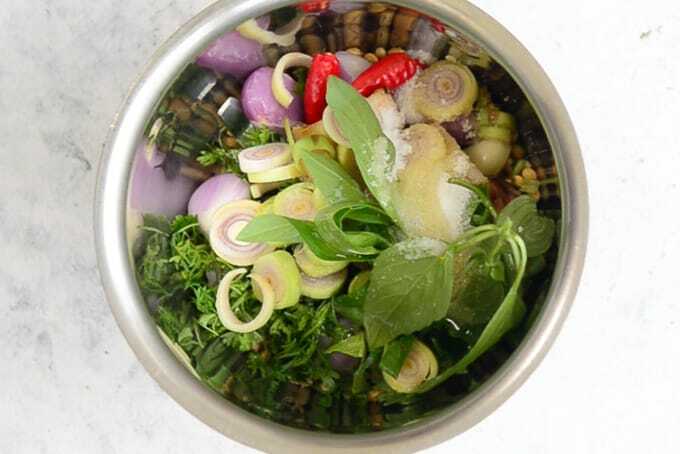 Can be used for making green curry, as marinade for chicken, shrimps or fish or in soups. 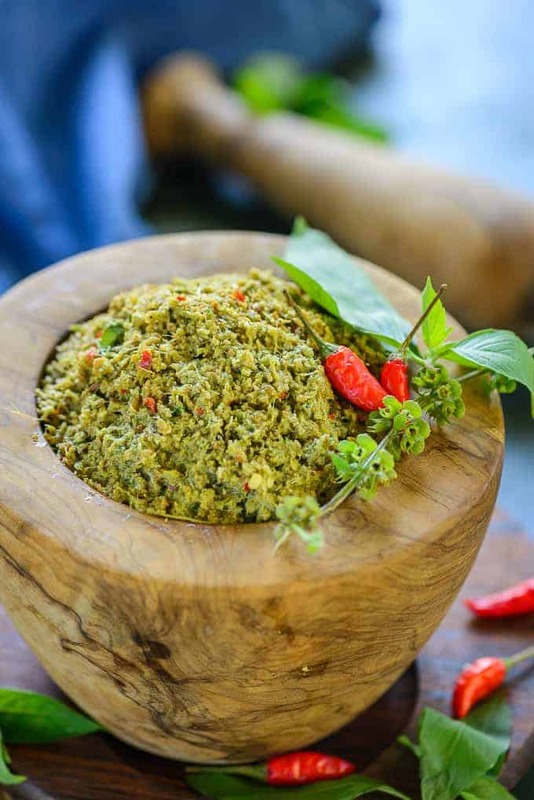 Green Curry Paste is simply prepared by using easily available ingredients like red chillies, fish sauce, lemongrass stalk, shrimp paste, galangal or ginger, kaffir lime leaves, coriander leaves and lemongrass give it a green hue. Shrimp paste gives a very traditional taste to this paste but if it is not available, you can skip adding it and replacing it with soy sauce. This tangy, spicy, sweet paste is used in the preparation of Thai Green Chicken Curry as well as other veg and non-veg preparations. Traditionally, this paste was made using a stone mortar and pestle. 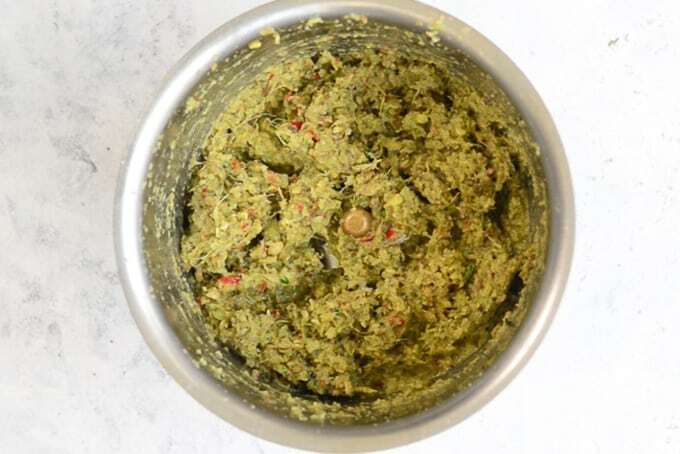 But now you do not need to use mortar and pestle for making this easy Thai Green Curry paste because it can easily be made in a food processor as well. Can I substitute red curry paste for green curry paste? Although Thai Green and Red Curry are very different in taste from each other, they can be used interchangeably in a recipe. The amount of both the pastes required to make curry is same and the way they behave while cooking is also same. Do not make the paste too smooth. It should be a little coarse in texture. Use fresh ingredients to make this paste. The taste of the ingredients shines through in the paste and it makes a lot of difference. Although these pastes are easily available in the market these days, the Authentic Thai Green Curry paste can be prepared within no time at home as well. It is definitely more flavourful than the store bought ones but it is also much economical to make at home. You can make a big batch and refrigerate for up to a month and use whenever required. You can also freeze the paste for later use. Skip shrimp paste and fish sauce or use vegan version of these to make a vegan green curry paste. This paste is also gluten free if soy sauce is not added. But you can add tamari for the flavour and yet keep it gluten free. You can also add some soy sauce as a replacement of fish sauce and shrimp paste. To make a vegan or vegetarian version of this paste, skip adding shrimp paste and fish sauce. Add 1 tbsp of Soy Sauce or Tamari (For Vegan Version) instead and keep the remaining ingredients same. This recipe is just dump and make one. All you have to do is to add all the ingredients in a blender and it’s already done. Green Curry paste ready in no time. Thai Green Curry Paste is a tangy, spicy sweet paste native to the region, that is added to a variety of curry's and gravy dishes. Dry roast coriander seeds, cumin seeds and black peppercorns until slightly fragrant and browned. Add all the ingredients in a mortar and pestle and pound to make a smooth paste. You can also add all the ingredients in a food processor and grind to make a coarse paste. Will omitting shrimp paste affect the flavor of the paste? What would be the vegetarian version of it? Which ingredient should act as a replacement for fish sauce and shrimp? You can skip using the fish sauce and add some more of Soy sauce for the veg version.